Binary.com is a renowned broker that aims to offer premier and easy conditions for trading binary options. Here are the key features of the broker. 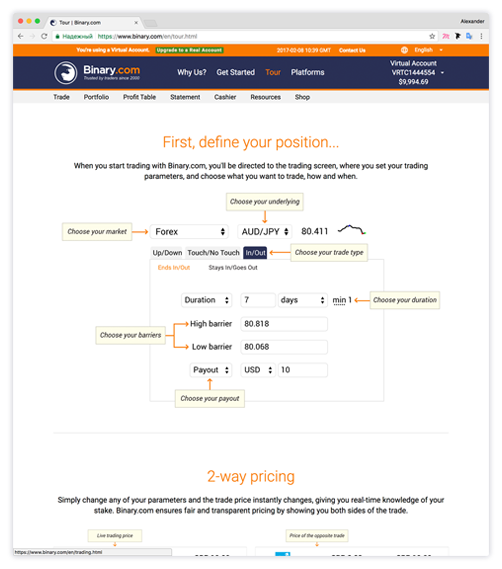 Initially launched as BetOnMarkets.com in 1999, the site was rebranded to Binary.com in 2013 to reflect the broker’s commitment to provide quality conditions to binary options traders. The website is simple and easy to navigate. We were able to find information about the broker quickly and without any difficulties. 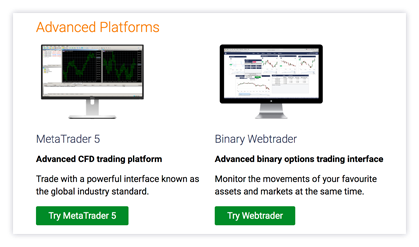 Binary.com offers a robust and innovative web-based platform for binary options trading. The platform is user-friendly and allows for 24/7 trading, even during weekends. 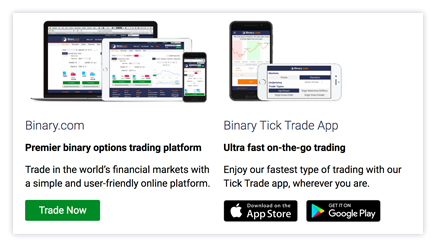 You can also download the mobile trading platform for iOS and Android devices and enjoy limitless trading, wherever you are. Some of the key features of the platform are ability to execute trades instantly, real-time monitoring of portfolio, and selling back trades at current prices. There is a $10,000 free demo account you can use to perfect your trading skills. The broker requires a minimum deposit of $5 when payment is made via electronic methods, such as Skrill, WebMoney, or Qiwi. The other payment methods require a minimum deposit of $10 to $100. Furthermore, deposits made via the electronic payment methods are processed instantly, while the other methods require up to five working days. Importantly, deposits are kept in segregated accounts maintained by AAA-rated financial institutions to guarantee optimal security of clients’ funds. Binary.com does not offer services to traders in the U.S. Traders in Costa Rica, and Hong Kong are also not allowed. Binary.com offers one of the most lucrative payouts in the industry. The simple rise/fall contracts can earn payouts of more than 100%. Furthermore, the higher/lower and touch/no-touch trades can earn payouts of more than 1,000%. Where else can you get this? Withdrawals are processed fast and are normally completed within one working day, if using the electronic payment methods. The other payment methods require up to 5 working days. Your bonus amount will be determined after opening an account and making the first deposit. Binary.com also runs frequent promotions and contests to offers traders with bonuses. Binary.com has a team of dedicated professionals who offer customer support via phone, email, or live chat 24/7. More so, the broker also has extensive tools and resources to assist traders curve a successful career in binary options trading. You’ll access trading ebooks, webinars, and other education materials important for equipping you with enough knowledge for profitable trading. Binary.com is the trading name of a company called Binary Ltd, which is fully licensed in the British Isles and Malta. Some of the regulatory bodies around the world that supervise the actions of the broker include Financial Services Agency, The Financial Futures Association of Japan, Malta Financial Services Authority, and UK Gambling Commission. Binary.com offers more than 100 financial assets for trading, which consists of commodities, indices, stocks, and currency pairs. And, the types of binary options available are Up/Down, Touch/No touch, In/Out, Asian Rise/Fall, and Higher/Lower. The broker offers flexible expiration times, ranging from 10 seconds to 365 days. Binary.com is committed to providing traders with conditions that best match their interests and trading styles. As such, the broker supports various languages, including French, Thai, Japanese, Spanish, Polish, Italian, English, Chinese, Portuguese, German, Russian, and Indonesian. Trading binary options with Binary.com is remarkably easy and profitable. The above key features of the broker have illustrated that it is dedicated to providing unmatched conditions to ensure traders enjoy reliable and hassle-free trading conditions. There must be a reason why more than 1 million traders have chosen it for trading. Why should you not jump in the train?